Back Row: Randy Evans, Joyce Wuerth, Craig Stafford, Bob Wuerth Frank Zammataro, Tom Hodson, Tom Queisser, John Chandler, Frank Bordonaro, Sally Bordonaro. Front Row: Carl Sandberg, Unknown Fellow, Les Rollins, Eddie Rollins, Mike Major, Jane Major, Marshal Spradling, Jeff Heckman, Unknown Fellow, Unknown Fellow, Marry Lou Carrington, Clem Pearce, Unknown Fellow, Ralph Haberfeld. Bottom Right: Terry and Berta Moore. The following bios were submitted by Fellows in preparation for the 2005 reunion. B.S. with honors in mathematics from Ohio University, 1968, followed by Ph.D. in theoretical mathematics (algebraic topology) from Ohio State University, 1972. Assistant Professor of Mathematics at Virginia Tech, 1972-73, then entered onto Army active duty and assigned as senior software instructor at the Army's data processing school, Fort Benjamin Harrison, IN. Branch transferred to the Medical Service Corps and immediately assigned to the Office of The Surgeon General, the Pentagon, 1976. Reassigned for second tour to the same office, then taught mathematics at the United States Military Academy, West Point, 1983-86. In 1985 detailed to the Los Alamos National Laboratory to participate in the Strategic Defense Initiative, authoring paper whose results were used in the fall 1985 US-USSR summit meeting. Reassigned to the Pentagon, Office of the Chief of Staff of the Army, 1986-89, then completed twenty-year Army career with the Office of The Surgeon General, 1989-1993. Authored novel, Shadows on a Mirror, recipient of 1999 Fiction Writers Award from the Maryland Writers Association and published in 2000. President of the Washington, D.C. Area Phi Beta Kappa Association, 2004-05, and elected to membership in the Cosmos Club, Washington, D.C., 2004. Two daughters, Amanda and Cynthia, living and working in Florida. Currently consultant and defense analyst living in Fairfax, VA.
Louise has a degree in journalism from West Virginia University. We were introduced in Boston by an Ohio U. alumna, Ellen Rubin Wood. I was completely captivated the moment I saw her at a Halloween party and the infatuation has not worn out. She awaits my removal of the toad costume. Rebecca was a brilliant elementary school student who lost her academic way in high school and is in her third college. Age and thyroid medication have made her a straight ‘A’ archaeology student. This month she and her husband are apart as he fixes up their first home in Fort Collins and works long hours while she works a dig in northwestern Nebraska. William is my dearest friend. Cerebral palsy limits his use of the muscles on his right side and, I sometimes think, short circuits some of the math and writing skills he should have inherited from me. He will graduate after just three and a half years with a degree in history. All history majors practice the line necessary for their future work lives: “Would you like fries with that?” In fact, he is the master of the insightful, brilliant question. Susie is the classic youngest child: spoiled, rude, and underachieving. She is so brilliant and so astonishingly talented in art, language and all things academic that I feel like Leonardo da Vinci’s father. Stanford rejected her. They are morons. (I am sure Diane Frank has no part in admissions.) Susie loves her cat and horses more than any family member and would probably trade me in for a good Arabian foal. She takes part in horse shows, but I was most pleased when she blew everyone away at the youth national championships in the contest of horse knowledge. She is obsessed. Dean Rollins pushed me toward business school and probably pulled some strings. I am grateful every day. In mid-June I was fortunate to have dinner with Kathy O’Donnell and Bob Fallon. Bob was a business school classmate of mine for two days (I never even saw him). He decided he was not ready and joined the Peace Corps. I was probably less ready. In December 1969 I passed my pre-induction physical and expected to be called in April, wiping out my first year of graduate school. My birthday drew number 267 in the first draft lottery. In June 1971 I went to work for a bad bank in Chicago; in June 1972 I joined a good defense contractor in Palo Alto. I love the Bay Area and regret not living there, but opportunity was pounding elsewhere. In the summer of 1972 the company I worked for suffered an almost unimaginable embarrassment. Our subsidiary in Maryland had only one customer. Someone well known as an employee of that customer came into the factory looking for a particular device and was given one “off the shelf”. Shortly after the D.C. police showed up asking about the device (which was found at the Watergate office building where there had been a “second rate burglary”), it was determined that this well known employee of our customer had transferred to employment at the White House some months earlier. It was a mortifying breach of all rational procedure. I did some volunteer consulting to a struggling (inside theft to buy drugs) minority owned grocery store in East Palo Alto. My alumni club team resulted in some contacts that led me to be recruited by a consulting practice in Orange County, CA in the spring of 1974. The firm I joined was narrowly focused on strategic planning for savings and loan associations. This was work more suited to my abilities, though it took my associates a while to recognize my potential. I had a front row seat for the government caused train wreck that characterized savings and loan associations in the first half of the eighties and for which your grandchildren will still be paying. Contrary to almost everything you have read, there were almost no crooks at the savings banks and the really bad guys worked for the taxpayers during the “clean-up”. In January 1974 the federal savings and loans and national banks in Massachusetts and New Hampshire were allowed to pay interest on checking accounts for the first time in America since 1934. Naturally, the perception of this opportunity by both thrifts and banks was about 180 degrees wrong. When I joined the consulting practice, I heard the conventional wisdom and quickly pointed out the fallacy underlying it. One thing led to another and I found myself clinging to a professional “fast horse” which I am still unable to escape. None of the Fellows should care about the details, but for 28 years I have had a growing and loyal following as the great guru of checking account marketing and profitability. (I tell banks to offer free checking!) I spend much of my time teaching bankers about the most basic concepts of macro and microeconomics (nothing past page one of the textbooks) and plain vanilla textbook marketing. For this priceless insight I have always made an excellent living and currently provide lucrative employment to about 25 people. At the end of 1988 my partners in the consulting practice decided they were all burned out and we sold the company to Grant Thornton. I chose not to go with the deal and continued my strange little checking account practice as Haberfeld Associates, Inc. (It is a very unimaginative name and I find it absolutely embarrassing, but my clients and associates insisted that it had value.) Because of my travel requirements, I found Denver more practical than Newport Beach. My business has required a lifestyle with many drawbacks. Basically, each Monday I get on an airplane, fly to a (usually) second tier city, and drive in the dark to a hotel. Tuesday morning I visit a bank and explain things that do not tax me intellectually. Tuesday afternoon I head for the airport to repeat the process three more times before my Friday afternoon flight home. When I lived in Orange County, I usually planned my travel to end in the Eastern Time zone so that I had three hours of clock adjustments to speed my arrival home. I was also a zombie both days of the weekend. In Denver, I am a zombie only one day of the weekend. I have worked with banks in all fifty states and the District of Columbia. In the Bay Area, before children, Louise and I were backpackers spending every weekend in Yosemite, Sequoia, Pinnacles, Big Sur, etc. (We took our children on a three-day backpack in Yellowstone eleven years ago. I carried fifty pounds without complaints and the little wimps gave up on primitive adventures.) In Orange County we were beyond the reach of worthwhile weekend hiking. When we moved to Colorado, Louise resolved to climb all 54 peaks over 14,000 feet. She conquered four. As our children like to say: “Mom broke her toe during the civil war.” (Do not bring a tray of food into a crowded family room during any Ken Burns PBS series; it is hazardous to your health.) Since then, her waistline has caught up with mine. To my embarrassment, there is a third more of me than any of you would remember in Athens. That disgraceful situation leads to hypertension and asthma medication. A long history of kidney stones has provided periodic excuses to “temporarily” give up regular exercise. As Diane Frank correctly observed, in Athens I was “socially awkward”. I am worse today. A shy wife and heavy travel results in almost no social engagements and few friends. We are reclusive. My children are worse than I ever was. That said, I never miss a reunion and am planning on being in Athens on November 22 and 23. I thoroughly enjoyed all of the Fellows back then and expect to again. We have a pleasant, if quickly emptying, nest. I have my dream aquarium; there is a wonderful koi pond in the backyard and today the water lilies are in full bloom. In May my irises and peonies gladden my heart and July will bring the day lilies. Winter is definitely not as nice as Newport Beach, but the sun shines almost every day and the sky is a blue unknown in the east. Frequent flyer miles allow fabulous family vacations. We have been to the South African game parks twice, New Zealand, Alaska, Hawaii (more times than I can count), and Australia three times. I am a great travel planner. (E-mail me before you go anywhere in the U.S or anywhere I have been.) With United Airlines’ well-deserved bankruptcy looming as a real possibility, I cashed in 1.8 million miles (I have no idea what to do with another million, much less when I would do it) last month and plan some snorkeling in Hawaii and a fourth family trip to Australia. In a big departure for me (I vacation in places that speak English, have safe drinking water, and I can rent a car), Louise and I are going to China in September where your school mate, Sze Wai Leung, has promised to guide us in Beijing and accompany us on a cruise up the Yang Tze to see the Three Gorges area before it is drowned in 2009. Always set a good example.A reputation for unbending integrity, both personal and intellectual, is not an intangible asset. It has enormous cash value. Recruiting is the most important thing any business does.Anyone willing to work with me for the best interests of my clients should be rewarded far more than if he had chosen any other employer. Do not read this section if you are easily upset. The big questions are the same as always: freedom, individual opportunity, peace, and sharing prosperity. That is a prioritized list. Recently we have been reminded that when some in our community are deprived of these basics, we are all at risk. In 1898 the United States redefined our community to extend beyond our borders. The best road to freedom, individual opportunity, peace, and sharing prosperity, is economic globalization. Globalization makes the whole world our community. Freedom is the first step toward all other progress. The lesson of war and peace that we faced in our youth should have been this: limited war is defeat in slow motion. We should never send young men to fight without the clear understanding that the only way a war involving the United States can end is with the unconditional surrender of our enemies’ armies, the public trial and execution of their civilian leadership, the military occupation of their territory, and the imposition of democracy, prosperity, and independence on our conquests as rapidly as possible. To fight this war we have George W. Bush. Our president is a man who is intellectually deficient, completely unaccomplished in the business world (Texas’ all time biggest welfare recipient), utterly unprincipled (steel tariffs, agricultural subsidies), a third generation career politician (Samuel Clemons said that “America has no native criminal class, except, of course, for Congress”), born with enormous wealth and connections used corruptly and royally, elected by an unholy alliance with intrusive religion and its fanatics, and with an identification with a business (oil) largely dependent on the Saudi royal family. Faced with the greatest opportunity for leadership since 1939, he has bumbled and wavered, but successfully read one great speech. It appears that he is beginning to figure out which of his advisers lives in the real world and his proposal for an eventual Palestinian state without Arafat is a huge step in the right direction. I have little hope that he is the right man to lead the nation, but lately he seems to have been making two steps forward for each step backward. He is not Teddy Roosevelt or Franklin Roosevelt or Harry Truman, but there is some hope that he will either do the job or in two years the American people will choose someone who will. What makes the Saudi royal family ‘royal’ other than insatiable greed? They are legitimized at home by an Islamic cult (Wahibism) that teaches that they are the instruments for inevitable world conquest. (This is not the Islam of India or Indonesia, but it is rapidly becoming so due to the unlimited Saudi financing of outrageous hate propaganda.) The United States should never claim an alliance with a country where any freedom of thought is a capital offense and women have about the same rights as house pets. In 1944 both the German government and people were the most profoundly evil in human history. The Japanese were not far behind. With the blessings of defeat and occupation, they have made real progress toward civilization. I think it is in our best interests to provide the same blessings to the Arab people. I am a warmonger! The United States should also get tough with our so-called allies in Europe, Canada, Australia, and New Zealand. The last three and Britain are the best friends any country ever had in time of crisis, but they continue to parasitize our huge investments in medical research. The Europeans are nothing but free riders on both our research and defense expenditures. For thirty years they have poured subsidies into a government sponsored business (Airbus Industrie) aimed at destroying America’s number one exporter. It is time for them to pay a fair share for our efforts. As the old saw goes: The French are extremely reliable allies; they are always there when they need us. My wife is a “yellow dog Democrat”, giving money and working long hours. My elder daughter persuaded her husband to register as a Libertarian, though she registered as a Republican “because it had a better primary”. My son is a Republican. My younger daughter registered as a Democrat because her mother threatened to cut off her supply of brownies if she chose another party. I vote in the Democratic primary, but I keep wishing that Thomas Jefferson, James K. Polk, Teddy Roosevelt, or Harry Truman would run again. I hate choosing the lesser of evils. The one political thing we all believe is that the luckiest thing that can happen to a human being is to be born a citizen of the United States. The purpose of this long submission: First, I want to be a good example. Only you can decide if this diatribe makes me one. Second, I have never loved or enjoyed a group of people more than the members of the Ohio Fellows. I really want to know where you are and how you got there. An extraordinarily wonderful man thought that each of us was destined to lead others in the right direction. I want to know how we are doing. I have deliberately included ungentlemanly references to my business life because I think we should get personal. Third, my section mates from business school have repeatedly inspired me to be a better person. The Ohio Fellows were a much broader and similarly able group. We should be inspiring each other. Dr. Thomas C. Dalton was awarded his Ph.D. in 1984 at the University of Massachusetts, Amherst in Political Theory and Public Policy. Dr. Dalton served in the Governor’s office of the State of Washington, in the late 1970s, where he was responsible for criminal justice information system policy. He then was appointed Director of Research and Lecturer in politics and public policy at the Institute of Public Service at Seattle University from 1978-1982. He has worked as a researcher at Cal Poly since 1983 and currently holds appointments as Special Consultant to the Provost and Senior Research Associate, Office of the Dean, the College of Liberal Arts. Dr. Dalton has published several books and articles in the fields of human development, public policy, the history of science and philosophy of mind. He is a co-author with Victor W. Bergenn of Beyond Heredity and Environment: Myrtle McGraw and the Maturation Controversy, Westview, 1995. Dalton conceived and was a consultant to the producers of Scientific American Frontiers, "Its a Kid's World," a documentary featuring McGraw and her successors that aired on the Public Broadcasting System on March 29, 1995. Dr. Dalton recently completed a forthcoming intellectual biography, Becoming John Dewey: The Dilemmas of a Philosopher and Naturalist (Indiana University Press, June 2002) and is currently at work on a book, Early Experience and the Brain: An Historical and Interdisciplinary Synthesis (Erlbaum). He also will be co-editing, with Rand Evans, a forthcoming book with Kluwer/Plenum titled The Life Cycle of Psychological Ideas: Understanding Prominence and the Dynamics of Intellectual Change. Dr. Dalton has been a Visiting Fellow of the Neurosciences Institute in San Diego, since August 1999. He has been a member of the Association for the Scientific Study of Consciousness, since its founding in 1996, and serves on the Executive Committee of Division 7 (Developmental Psychology) of the American Psychological Association. He also holds memberships in the International Society for Infant Studies [ISIS], the Society for Research in Child Development (SRCD) and Cheiron (Society for the study of the History of the Behavioral Sciences. Carl Hjalmar Sandberg is an entrepreneur based in Silicon Valley. He resides in Palo Alto, California with his wife, Charito Monroy. Carl has served as Founder, Board Member, and Chief Operating Officer of a startup streaming video company, Founding General Partner of an investment and professional services firm, Chief Operating Officer of an Internet wireless messaging company, and Chief Operating Officer of a digital identification solutions company. Carl was born and raised in western Pennsylvania and is the son and grandson of Swedish-American coal miners. During his 29-year career in high technology industry, management consulting, and executive search, he has worked for or advised major international businesses, FORTUNE 500 companies, and more than 30 startup companies. His international experience includes managing operations and completing business projects in Japan, The People’s Republic of China, Taiwan, Hong Kong, Korea, Indonesia, Singapore, Malaysia, Thailand, India, Turkey, Hungary, Austria, Germany, Sweden, The Netherlands, The United Kingdom, France, and Italy. He has lived in nine US states and England, flown more than two million air miles, and visited more than 235 cities in 35 countries. Carl holds an MBA degree in general management, corporate finance, and information systems management from the Harvard Business School with additional graduate work at the Harvard Law School and Harvard’s Kennedy School of Government. Prior to attending Harvard, he was awarded the first Master’s degree in Russian and East European studies granted by The University of Michigan. In this program, he specialized in economics and Russian and completed additional graduate work at The University of Michigan Law School and Columbia University. 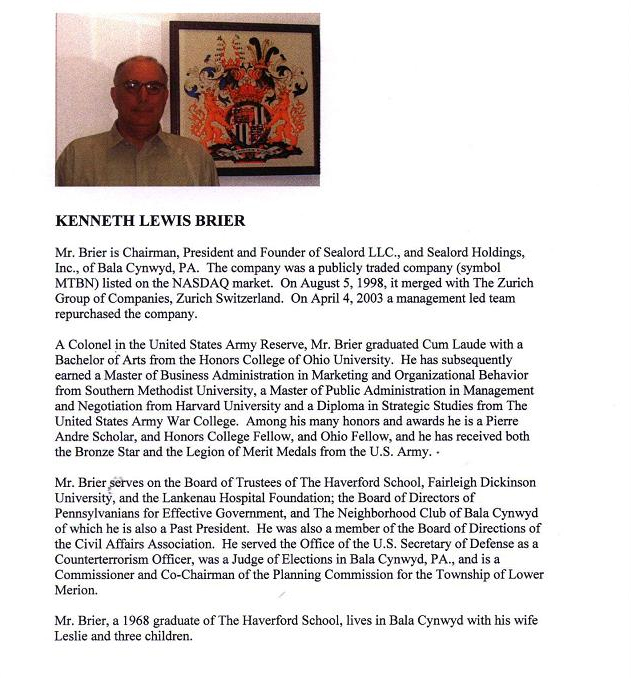 His other degrees include: Master’s and Bachelor’s degrees in philosophy, politics, and economics from Oxford University with additional graduate work at Oxford’s St. Antony’s College and School of Oriental Studies; an Ohio University Master's degree in mass communication; and an Ohio University Bachelor's degree in government, psychology, and general studies. Carl also attended Stanford University and The University of California at Berkeley. At Stanford, he studied Internet technologies, building high technology businesses, Mandarin Chinese, and the history of Chinese classical painting. At Berkeley, he studied developing and executing high technology marketing strategies. Carl was awarded Cabot and Humphrey Fellowships at the Harvard Business School and played intercollegiate and league rugby. At The University of Michigan, he was a Rackham Fellow, was awarded an international fellowship to participate in an economics conference in Venice, Italy, was twice elected Student Body President, and served as Graduate Student Body President. At Oxford University, he was nominated for two university economics prizes, was selected as the university’s outstanding student in politics, and was the first foreign student awarded the Gibbs Scholarship in Politics. In recognition of this award, he was elected as Honorary Scholar by the Master and Fellows of his Oxford college. At Ohio University, Carl was a scholarship, Dean’s List, and Honors College student and was a member of the first class of 20 Ohio Fellows selected from the 12,000-member student body to participate in a four-year leadership development program. He also was: A member of “Who’s Who Among Students In American Colleges And Universities”; Legislative Intern with the Ohio General Assembly; founder and first President of the Ohio State Student Government; President of the Ohio University Student Government; Editor-in-Chief of the Student Guide to Courses and Instructors; and a participant in Judo. Carl completed active and reserve military service as a Major and paratrooper in the United States Army. He served in command and staff positions in Infantry, Airborne, Special Forces, and Special Operations units, as a Russian and East European Foreign Area Specialist, and on the staff of a Major General. He is a graduate of the US Army Basic and Advanced Infantry Officer Courses, the Special Forces Officer Course, and the Airborne, Jumpmaster, and Air Operations Courses. He is a member of the Special Forces Association and the 82nd Airborne Division Association.